After a year off, AAC is holding the Silencer Shoot again in Crawfordsville Arkansas (just outside Memphis). Gun Trust Lawyer® is helping to sponsor the event and raise money for this years charity. While the silencer shoot is not silent, it is a far cry from the noise at Knob Creek. We will be giving away trusts and look forward to meeting many of our new clients. For more information on the event check out AAC’s Silencer Shoot 2011 event page. Remember that even though you do not need a 5320.20 to travel with your silencer across state lines, we recommend getting approval to avoid the unnecessary detention of yourself or firearms while uninformed officers determine that you are rightfully and legally in possession of a silencer. This weekend I was up in Tennessee for a 2A rally that was sponsored by Barrett firearms. Apparently Mayor Bloomberg has come to Tennessee to declare that acts that are legal in Tennessee and most states are illegal because they end making it easier for New Yorkers to get guns. There were lots of TV reporters and state officials. I did find it odd, that none of the TV stations covered the 2A aspect and only focused on the New York issue. While up there I got to see a 50 Cal silencer and took a picture of it next to a 22 silencer for perspective. 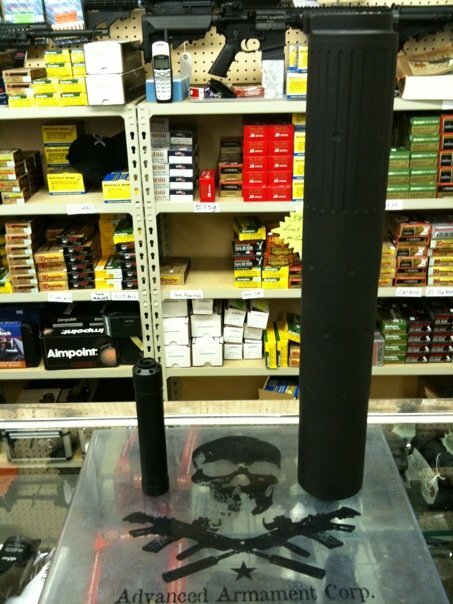 You would not believe how big the 50 Cal silencer is. I would guess that it was 7-10 lbs. ostensibly that a local chief law enforcement officer (CLEO) sign the transfer forms. In Tennessee, this is normally the sheriff of the individual’s county of residence except in Davidson County where it is the Chief of Police. 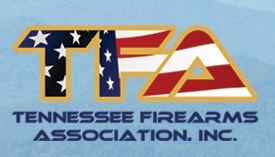 Tennessee (TN) What NFA Firearms can I own?